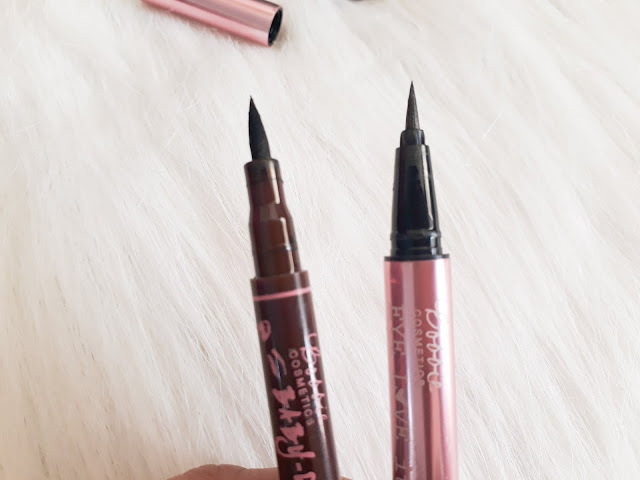 Bobbie Liquid Eye Liners: Baby Doll Eyes vs Eye Love It! Bobbie Cosmetics is known for its affordable and cutesy packaging. I admit, when I was younger, I used to admire Bobbie's mall modules because it do attracts yuppies and teens. Because Bobbie Cosmetics was made for make up beginners, the brand made it very affordable and conve ient to its target market. 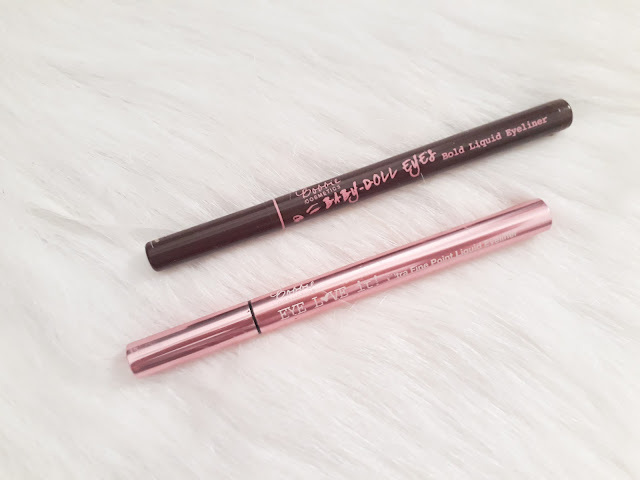 For today, let me share with you two of Bobbie Cosmetics' pen eyeliners: The Baby Doll Eyes Bold Liquid Eyeliner and Eye Love It Extra Fine Point Eyeliner. Both eyeliners are in a form of pen which makes it easier to grip and glide to the lids. The Baby Doll Eyes is in the brown pen while the Eye Love It is in the metallic baby pink pen. Since the Eye Love It has an Extra Fine Point feature, which makes it look thinner on the swatch. 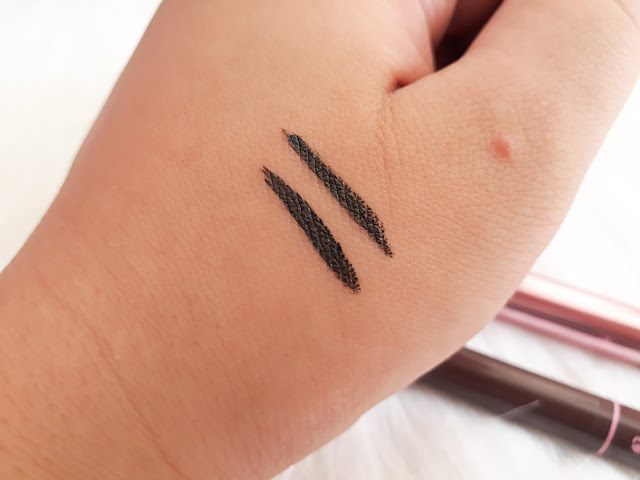 Swatches above shows the eyeliner's pigmentation and although thin, I am impressed with how it looks like at first swipe. The Baby Doll Eyes on the other hand is thicker, hence, the name. 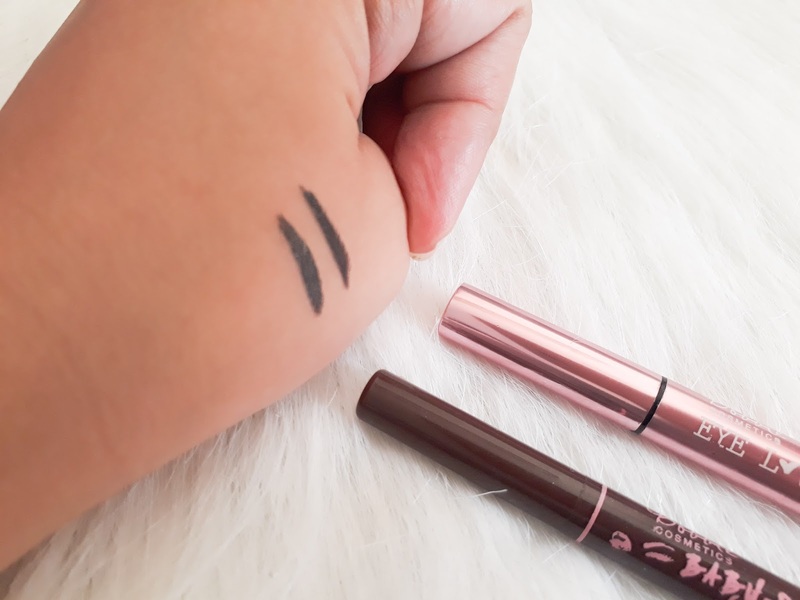 This eyeliner will make the eyes look deeper and fuller because it has a thick finish. It is pigmented as well and I also love its finish. The thing I like about pen eyeliners is that they dry easily compared to the liquid ones. 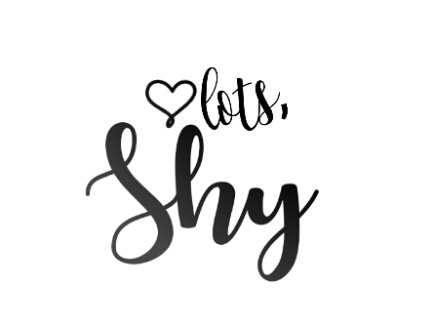 It also finishes matte so you don't have to worry about smudging. For me, both really performs well. As for the price, probably the Eye Love It is more expensive because of its metallic packaging and fine point, but both performs exactly the same. Both will give you an accent to the eyes just different on how it will look like. But still, it's below 200 pesos so it is very affordable. I would suggest the Baby Doll Eyes to everyone who wanted to look and have bigger eyes. 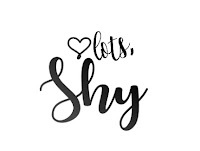 For the Eye Love It, I would suggest it to everyone who already have doll eyes but still want to add accent to their eyes.